Get inspired by a few trends in bathroom design. The bathroom is a special and sacred place in may people’s home whether you share one with your whole family or you are lucky to a have private facility. From the bathtub to the sink countertops, every aspect of your bathroom should fulfill you and your family’s needs. If you’re renovating your bathroom or building your home from the ground up, you should follow the latest design trends for inspiration. Regardless of the size of your bathroom, it is smart to have enough storage space and have them in efficient areas around the room. Incorporate storage spaces in pieces already in your bathroom such as your vanity. Having vertical cabinets under your vanity maximise the amount of space you have in your bathroom. Take advantage of open shelves especially by your bathtub or shower, so towels and other accessories are in arms reach. Whatever year we are in, smart storage will never go out of style. 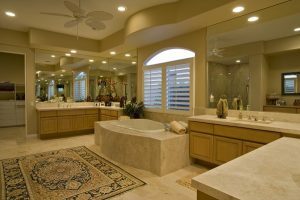 Since the bathroom is a functional area in the home where people tend to get ready for the day or an event, it is essential that the room is well lit. Start with your vanity and get creative with lighting fixtures. Focus on nice overhead lighting, and have the fixtures align with your own design aesthetic. Proper lighting in your bathroom makes everyday tasks go swiftly and opens up the space at the same time. Homeowners are still choosing neutral colors like whites, creams, and light browns to infuse into their bathroom design. These neutral colors can turn any area of your home into a more modern and elegant space. The rise in neutral tones allows for homeowners to install natural stone countertops into their bathroom. Natural stone countertops are very durable and will add some natural beauty to any bathroom. This entry was posted on Monday, September 11th, 2017 at 8:43 pm. Both comments and pings are currently closed.